Are you fed up with fur all over your furniture? Is it getting embarrassing to be seen with dog fur all over your clothes when you arrive at work? Dogs naturally shed their fur but you don’t need to put up with it all over the place. 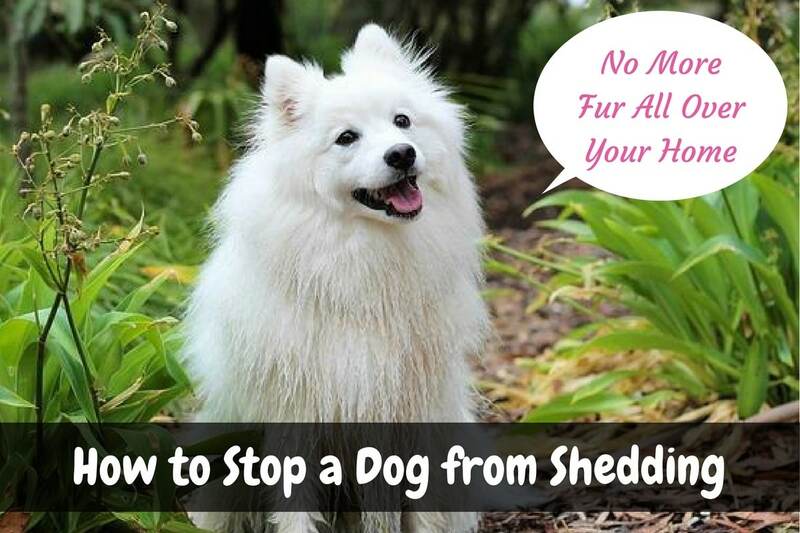 If you want to know how to stop a dog from shedding, here are the best tips that really work. And you don’t even have to visit a dog groomer. Click Here to see the current price on the ZoomGroom. This brush is perfect for removing shedding dog hair and is used by professional dog groomers. If your dog is shedding fur, you’ll notice straight away. Most dog owners see a fair bit of fur on their furniture and around the house. And even if your dog lives outside you’ll notice fur on the dog bed. There will most likely be fur also on the places where your dog enjoys sitting or rolling around outside. We all worry about our pets and if you see fur falling out it can be alarming. Just remember that a certain amount of shedding is normal. So, before you learn how to stop a dog from shedding, let’s take a look at what isn’t normal. Shedding occurs naturally but if your dog is shedding too much, this is a reason for concern. It may be a sign that something else is wrong. If you have a puppy you need to realize that grooming is very important as your puppy grows and changes. If your puppy is shedding excessively it could just mean their adult coat is coming in. You will need to learn how to stop a dog from shedding all over the house if your puppy is losing his or her puppy coat. Otherwise you will notice fur everywhere. During this time you need to brush them thoroughly every day. This should continue until their puppy coat is eventually replaced. Dogs naturally get rid of old damaged hair. But if your dog sheds too much it could be a sign of ill health or it might just mean you’re not taking proper care of your dog. To fix a shedding problem you should start by ruling out grooming issues. If that doesn’t work and you’re unable to diagnose the problem it’s important to take your dog to get checked by a vet. If you have a young dog that is maturing and shedding their puppy coat you might also consider getting their old coat trimmed to speed up the process without a lot of fur getting everywhere. Am I Using the Wrong Dog Shampoo? Another reason for shedding could be your dog shampoo. It’s great to learn how to stop a dog from shedding by using grooming techniques but if you’re using a chemical based shampoo this can cause unnecessary hair loss. The wrong shampoo can cause more hair loss in older dogs and skin irritation in younger dogs. It’s easy to switch shampoos to a natural product, so this may be a good time to try a different one. This dog shampoo (image shown on the right) is a natural oatmeal product which cleans your dog well and smells good too. It is alcohol and paraben free. And it’s pH balanced to suit your dog’s skin and fur. The coconut lime is pleasant smelling for you and your dog. If the problem is not a grooming issue, there are a number of ailments which can cause excessive hair loss. Parasites such as fleas, lice and mites are quite common on animals and can cause unnatural shedding. Check your dog for parasites and if you’re unsure, see the vet about it. Parasites can multiply very quickly so you don’t want to delay if you suspect anything. And if your dog lives inside your home, you’ll want to get rid of those pests as quickly as possible. Not only do they cause problems for your dog but soon you’ll be feeling their presence as well. Another ailment which can cause excessive shedding is a bacterial skin infection, such as mange. If your dog’s skin is affected you need to get treatment as soon as possible. A side effect of some medicines can be hair loss. If your dog has been placed on a new medicine, you need to check with the vet to see if this could be the cause of the shedding. A more serious cause could be a disease or skin cancer. If your dog’s fur is coming off in dry clumps you need to take it seriously and get to the vet as soon as possible. Even if you’re not sure whether you’ve ruled out the other less serious causes, it is always advisable to get the vet to diagnose and treat what is causing the shedding. Here are some tips to help prevent shedding in the first place. If you want to know how to stop a dog from shedding, prevention is he best place to start. First, be sure to bathe your dog regularly. Baths help wash away old and dirty fur so it doesn’t end up around the house and on your belongings. Another way to prevent excessive shedding is to brush your dog regularly. The longer haired breeds will require more frequent brushing to deal with shedding more quickly. To brush your dog properly you should start with a wire brush and remove the tangles and any matting fur. Once you finished that stage, change to a softer brush make from bristles. If you have a short-haired dog there are also silicone mitts made for grooming. They are easy to use and quite effective for short-hair breeds. When you first learn how to stop a dog from shedding you need the right tools. One of the best products available is the rubber brush that looks like it has little traffic cones instead of thin spikes. The ZoomGroom is a great example. The ZoomGroom is known to be used by professional dog groomers to eliminate shedding. Many pet parents call in the groomer as soon as they see shedding and the groomer will bath and brush the dog to remove all loose hair. You can easily do the same at home. See the LARGE size ZoomGroom here. This is the SMALL size ZoomGroom here. Start with the wire brush, especially if your dog is a long-haired breed. Then move on to the ZoomGroom by Kong or a similar brushing tool. The ZoomGroom is available in different sizes. The smaller size is for smaller breeds and puppies. But if you have a large dog you’ll definitely need the larger size. The ZoomGroom really does outshine other grooming brushes. It can be used wet while bathing your dog or dry for brushing. The ZoomGroom stimulates capillaries and natural oil production for healthy skin and fur on your dog. Any disadvantages of using ZoomGroom? Just a word of warning about the ZoomGroom. It’s great to learn how to stop a dog from shedding by using a ZoomGroom but if you’re using it for dry brushing, it’s best to do it outside. The loose fur will fly off and make a big mess inside your house. And the whole idea is to reduce the amount of fur all over your house! You really will notice the results using a ZoomGroom. I would even go so far as to recommend you buy two ZoomGrooms. I know how frustrating it is when you can’t find it because your children or another “responsible” person in your household hasn’t returned it to the shelf for safe keeping. This is how much you rely on it. It’s such a great product. Buy two. It may sound like a chore having to brush your dog regularly but if you set aside the time you’ll find you enjoy spending this time with your dog, and your dog will enjoy it too. Just don’t try and cram it into your daily schedule when you’re running late for work or you need to pick up the kids in the next 5 minutes. If you rush it you may hurt your dog without realizing and turn your dog off grooming forever. If you do have a dog who hates to be brushed, I’d try the ZoomGroom. It’s only a few dollars and it might just make your life a whole lot easier. Many dogs and cats enjoy this grooming brush even though they hate other brushes. Grooming your dog can be a relaxing experience. And once you learn the technique for how to stop a dog from shedding, and use the right tools, it is a beneficial and calming experience for all. Use the right brushes and choose a quiet time of the day. If you tend to leave it too long between dog grooming sessions, try making a note in your diary or calendar so you don’t lose track of time. Aim to set aside time on the weekend if that suits you and stick to a routine. The more regular the grooming, the better the results. Just remember, there will be times when your dog gets mats and they’ll take longer to untangle. Fur mats can cause other problems for your dog, so it’s best to remove them as soon as possible (see here for more details on removing fur mats). When extra time is needed don’t try to rush. Put the brushes away and return to grooming later in the day when you have more free time. If your dog senses your frustration they’ll probably make the grooming session more difficult. Most shedding problems are the naturally occurring process of replacing one coat with another. Once you learn how to stop a dog from shedding all over your home, you’ll feel more confident in dealing with it when you do see shedding. If shedding is excessive you should keep your mind open to all the possibilities. And at the end of the day, if grooming isn’t the issue, take your dog straight to the vet. ✅ Worried about your dog choking? Slow down eating with a Slow Feeder Dog Bowl. ✅ Keen to find the best dog toys to give your fur baby mental stimulation? click here. This entry was posted in Dog Grooming on June 25, 2017 by Didi.